Jonathan Rea powered his Honda to the lowest lap time in Thursday’s free practice in preparation for Sunday’s Suzuka 8 Hours World Endurance race. The 23-year old Irishman recorded a time of two minutes, 8.789 seconds during the hottest of the two hour-long sessions. Second best was Ryichi Kiyonari, also on a Honda, with a time of two minutes, 9.458 seconds, and eager to go even faster. Third fastest was the Yoshimura Suzuki, with Yukio Kagayama riding through the pain from his right-hand broken in a crash at Mallory Park round of the British Superbike championship almost a month ago. The genuinely please Japanese rider’s best time was two minutes, 9.764 seconds. The next four teams were all on Hondas, followed b y a Suzuki at two minutes, 12 seconds flat. 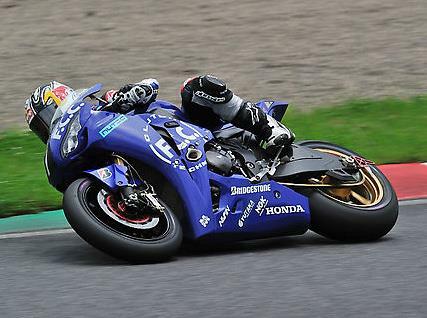 Yamaha France GMT-94 were ninth overall and best of the World Endurance championship contending teams. Qualifying takes place on Friday, followed by Superpole on Saturday and the race on Sunday. 1 F.C.C. TSR Honda (K.Akiyoshi/J.Rea/Y.Takahashi), 2:08.789, Honda. 2 Musashi RT HARC-PRO (R.Kiyonari/T.takahashi/T.Nakagami), 2:09.458, Honda. 3 Yoshimura Suzuki with Enos (Y.Kagayama/D.Sakai/N.Aoki), 2:09.764, Suzuki. 4 Keihin Kohara Racing (S.Ito/M.Tamada), 2:10.015, Honda. 5 Dream RT Sakurai Honda (C.Kameya/W.Maxwell), 2:10.929, Honda. 6 Team Plus One (S.Iwata/Y.Teshima), 2:11.805, Honda. 7 Crown Keibibhosyou Racing (T.Hamaguchi/K.Kitaguchi/S.Tani), 2:11.886, Honda. 8 Plot Faro Panthera (O.Deguchi/T.Yasuda/Y.Kodama), 2:12.088, Suzuki. 9 Yamaha France GMT-94 Ipone (D.Checa/D.Cudlin/K.Foray), 2:12.431, Yamaha. 10 Teluru Honeybee Racing (H.Noda/t.sekiguchi), 2:12.804, Honda.